One of the most common digs against Occupy protesters here in Humboldt County has been, "What the hell are they doing here in Humboldt County?" In the unlikely event that the CEO of Goldman Sachs has heard about the encampments in Arcata and Eureka, chances are he's not exactly shaking in his Italian leather Guccis. But even here in remote, working-class Humboldt County, a few people earn enough money to rank among the top 1 percent of wage-earners nationwide. They're not exactly jumping up and down, asking to be identified, but they are here. Before we get to that, it's worth noting how successful the Occupy Wall Street movement has been at dividing the populace this way. Thanks to their brilliant slogan, "We are the 99 percent," Occupiers stacked the deck in their favor, preemptively putting almost everyone on their side of the argument. Almost everyone. The remaining 1 percent, as a group, looks downright rapacious under scrutiny. In the May 2011 issue of Vanity Fair, Nobel laureate economist Joseph Stiglitz helped lay the groundwork for the Occupy movement by saying the wealthiest 1 percent of U.S. citizens control 40 percent of the nation's wealth. Other measures are similarly eyebrow-raising. Between 1979 and 2007, 1 percenters saw their average household income nearly quadruple while the rest of us stayed more or less flat, according to data from the Congressional Budget Office. Meanwhile their share of the country's total income grew by more than 120 percent while the bottom 80 percent's shrank. Not everyone sees these numbers as problematic. Plenty of people (including many in the 99 percent) frame our cultural divisions differently, describing the wealthiest Americans as job creators, the very engines of our economy. We decided to seek out 1 percenters here in Humboldt County to get their thoughts on the issues at play -- income inequality versus class warfare; corporate welfare versus stifling the job creators, the right peaceably to assemble versus municipal camping ordinances, etc. This task proved more challenging than we'd anticipated. If there's a local Warren Buffet -- someone in the top 1 percent who's willing to chat about it -- well, we didn't find him or her. First we had to learn where the 1 percent line is drawn. Many in the Occupy movement talk about wealth and income as if they're interchangeable. They're not. Measuring wealth involves many variables, from age and income to personal property, debt and rates of return on investments. Not surprisingly, most analysts focus on income levels, which are measured by the IRS, the U.S. Census Bureau and numerous nonprofits. Last month the Wall Street Journal produced a widget on its Real Time Economics blog that allowed readers to plug in their annual household income and find out where they fall in the 99 percent -- or the top 1 percent; the cutoff was $506,600. Reporter Phil Izzo, who produced the widget, said he used data from the nonprofit Tax Policy Center. That group, in turn, uses a "micro-simulation model" that takes more than 600 words to explain. We decided to take a straightforward approach, using IRS data on adjusted gross income. In 2009 (the most recent data available), the top 1 percent of individuals in the U.S. earned $343,927 in pre-tax income. If you made that much or more, you're in the 1 percent. Congratulations. 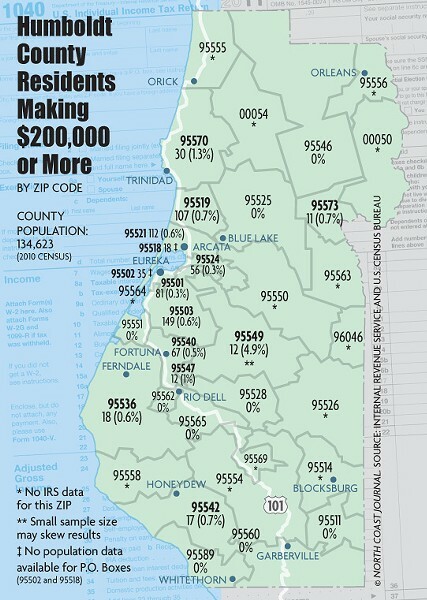 IRS reps said they couldn't provide the total number of Humboldt County residents above the 1 percent threshold, for privacy reasons. They were able to point us the number of folks making over $200,000 -- which puts them well into the top 5 percent (lower limit: $154,643.) We have more than 700 of them. Working our way up toward the high-income peaks, we started by reaching out to locals who we know are there because their salaries are public: government employees and nonprofit executives. HSU President Rollin Richmond barely made the cut with a pre-tax 2009 salary of $352,920. Richmond couldn't be reached because, according to an HSU spokesman, he was in "wall-to-wall meetings" in Long Beach. Coast Central Credit Union CEO Dean Christensen easily cleared the bar, bringing in more than $1 million in fiscal year 2009-10. Reached by phone, he declined to weigh in. St. Joseph Hospital CEO Joe Mark ($523,297) could not be reached. A St. Joe's spokesperson said, "We are going to abstain from commenting." The Journal also called more than a dozen private-sector workers who we suspected might be in the top 1 percent. Very few returned our calls. Those who did either denied being in the top 1 percent or declined to comment. Security National CEO Rob Arkley was asked for his thoughts via email. He replied simply, "no interest." Patrick Cleary, president of Lost Coast Communications, said he was briefly part of the 1 percent, back when he was a Wall Street investment banker for Chase-Manhattan. "I know people don't remember this," Cleary said, "but there actually were ethics on Wall Street once upon a time." When he was there in the 1980s and '90s, he said, "you took care of your clients [and] did things in a gentlemanly way." He compared Wall Street's transformation to that of the Pacific Lumber Co. after it was taken over by Texas businessman Charles Hurwitz and his Maxxam corporation. In other words, ruthless greed prevailed. While Cleary finds labeling people problematic, he also believes there's room to raise taxes on the wealthiest Americans without conjuring the demons of socialism and class warfare. "What I see is a worshiping of the 1 percent -- 'They're the job creators; you can't raise taxes on them in a recession,'" Cleary said. "I think that's hogwash. I think we're afraid to even have that discussion."